The plot itself, loosely based on the writings of Isaac Asimov, is pretty elementary. Are the machines about to take over the world or is this apocalyptic vision build upon good, old-fashioned bigotry? However, a sharp script, excellent acting and some snappy direction help lift what could have been an SF pot-boiler into the realms of classy cinema. 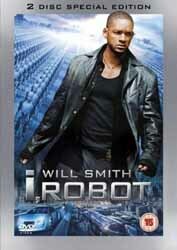 Will Smith's Spooner is a totally believable character, often at odds with his psychologist assistant, Dr Susan Calvin, who specialises in the psyches of robots. And Sonny, the suspected killer, is all too human despite his mechanical construction and CGI presentation - you really start to feel for him after a while. Other strengths include a first class soundtrack (great in 5.1), some classy set designs and a real sense of building tension. Perhaps the only real weakness is an over-reliance on CGI which sometimes robs the action of a sense of gravity and weight. But these are minor considerations when weighed up against the film as a whole, especially as the transfer to DVD is as crisp and clean as you could hope for. So is the world about to be overrun by robots? Watch the movie. But beware, you may never be able to trust your household appliances ever again. You know that programmable washing machine... could it really harbour a deep-seated hatred of you? A good movie and a good disc. You really couldn't ask for more.